WASHINGTON, DC, June 4, 2012 (ENS) – Three conservation organizations today filed legal action challenging the U.S. Environmental Protection Agency’s failure to update air quality standards for acid rain. The petition for review was filed in the federal Court of Appeals for the District of Columbia Circuit by the Clean Air Council, Center for Biological Diversity and National Parks Conservation Association, represented by the nonprofit law firm Earthjustice. Today’s action has a long history. The Clean Air Act requires the EPA to set so-called “secondary” air quality standards limiting ambient concentrations of air pollutants that affect “public welfare,” which includes ecosystems and natural resources. The Center for Biological Diversity and other groups sued the agency in 2005 over its failure to review the secondary standard for sulfur and nitrogen compounds that react with the water molecules in the atmosphere to produce acid rain. The standard was first established in 1971 and has not been updated. That litigation led to the EPA’s current review of the standard, in which the agency admitted that existing standards are inadequate to protect sensitive ecosystems and fish species from the effects of acid rain. The groups argue that the EPA “chose to leave these inadequate standards in place,” and that the agency has rejected efforts by EPA scientific experts to write a new, more protective standard. Coal-burning power plants, factories, and motor vehicles emit sulfur and nitrogen compounds into the air. The gases can be carried hundreds of miles in the atmosphere before they are converted to acids and deposited. In the past, factories had shorter smokestacks that polluted the air locally. Today’s taller stacks cause the pollutants to be carried farther afield. When these sulfur and nitrogen compounds bond with snow and rain, it falls on forests, rivers and lakes, creating an acidifying effect harmful to trees and to fish and other aquatic life. Although many places across the country are at risk from acid rain, the eastern United States, including the Adirondacks, the Green and White mountains, and the Appalachians, as well as the upper Midwest, are among the most sensitive areas. In the Adirondacks, the groups point out, lakes with more acidic water support only half the species of fish that might otherwise live there. Reduced growth rates in trout and salmon also have been attributed to acid stress. “Instead of following the law and doing what is necessary to protect our natural resources, EPA has chosen to sit on the sidelines. Meanwhile, acid rain continues to poison our waters and threaten our forests,” said Joe Minott of the Clean Air Council, based in Philadelphia. 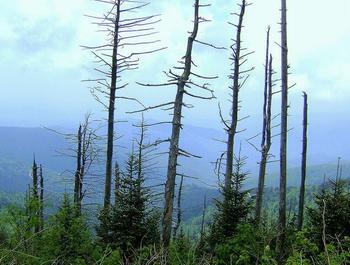 The high elevation forests of the Appalachian Mountains from Maine to Georgia damaged by acid rain include areas such as the Shenandoah and Great Smoky Mountain national parks. The level of sulfur dioxide in the air has diminished over the past two decades. The EPA’s Acid Rain Program was established under the 1990 Clean Air Act Amendments and requires emission reductions of sulfur dioxide, SO2, and nitrogen oxides by the electric power industry. The program sets a permanent cap on the total amount of SO2 that can be emitted by electric generating units, and includes provisions for trading and banking emission allowances. 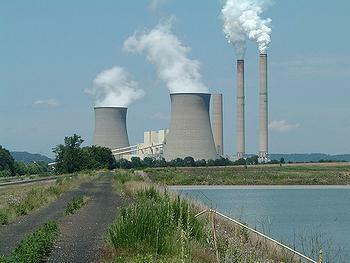 The program was phased in, with the final SO2 cap set at 8.95 million tons in 2010, a level of about one-half of the emissions from the power sector in 1980.